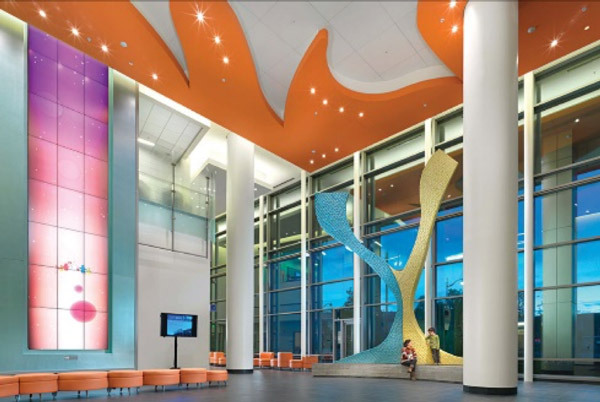 Taking the art of healing to a new level, San Francisco’s newest medical campuses and hospital buildings offer countless art installations, illuminated sculptures, murals, and other works of art, all of which are open to the public. We’re featuring a few of our favorite locations below – be sure to check out the art maps and artist information to fully prep for your art visit! UCSF Mission Bay – In honor of Nobel Laureate and Emeritus UCSF Chancellor J. Michael Bishop, MD, the public art collection at UCSF Mission Bay features impressive works of art from notable artists, both local to the Bay area and beyond, such as Mark Citret, Rosana Castrillo Diaz, Kota Ezawa, and Miroslaw Balka. A myriad of sculptures can be found throughout the campus as well, including SF native Richard Serra’s monolithic sculpture, “Ballast,” in the campus’ east plaza, and Mark Di Suvero’s colossal “Dreamcatcher” on the eastern side of the Koret Quad. The online art collection and art map serve as great tools to begin planning your visit. Kaiser Permanente Mission Bay – Cliff Garten’s massive, stainless steel LED sculpture appropriately named “Monarch,” is highlighted at San Francisco’s newest medical facility, Kaiser Permanente. Representing the gathering and migration of Monarch butterflies, the sculpture is a metaphor for how individuals are stronger in communities rather than alone. Just a half a mile walk from ONE Mission Bay, the gorgeous multi-colored luminescent sculpture can be seen and experienced at the park adjacent to the building at 1600 Owens St.
Zuckerberg San Francisco General Hospital – Less than three miles away from One Mission Bay, the Priscilla Chan and Mark Zuckerberg San Francisco General Hospital and Trauma Center offers 14 art installations and more than 200 framed works, all open to the public. Cliff Garten’s “Ethereal Bodies 8” and Anna Valentina Much’s “Archipelago” are just two of the impressive light sculptures among the collection. Though not exclusively Bay Area artists, a number of commissions went to these locals which is such an impressive feat! Feel free to check out the portfolio to see the latest pieces and get sneak peaks of what’s to come. 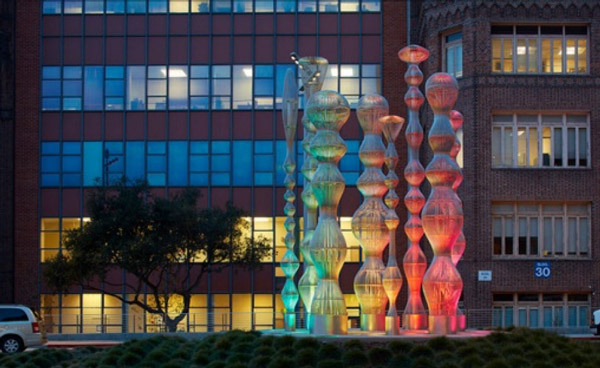 UCSF Parnassus – Sculptures from renowned artists including Beniamino Bufano, Robert Arneson, Nathan Olveira and light artist Jim Campbell are housed at UCSF’s Parnassus campus. Also featured are gorgeous murals by Douglas Cooper and Jana Alicia, as well as a dynamic installation mirroring liquid metal by Sarah Sze, flowing down the three-story front window of Kalmanovitz Library. The library actually houses most of the art installations, while six are located on the green space of Saunders Court. The art map can be found here.